Hemlock - White Buffalo Trading Co. Poison hemlock, California fern, deadly hemlock, Nebraska fern, poison parsley, poison stinkweed, snake-weed, spotted hemlock, wode whistle, witch's whistle. Conium maculatum is a native of Europe, western Asia and North Africa. It was brought to the United States from Europe by the early Pioneers as a beautiful garden plant. Poison hemlock is common and spreading in parts of the United States and Canada, particularly on the West Coast, from California to Washington; it is common and of some importance in New Zealand, and it also occurs in South America and the British Isles. In Australia, it occurs generally throughout the southern states but has occurred as far north as Queensland. Despite some safety concerns, hemlock leaves, root, and seeds have been used to make medicine for years. 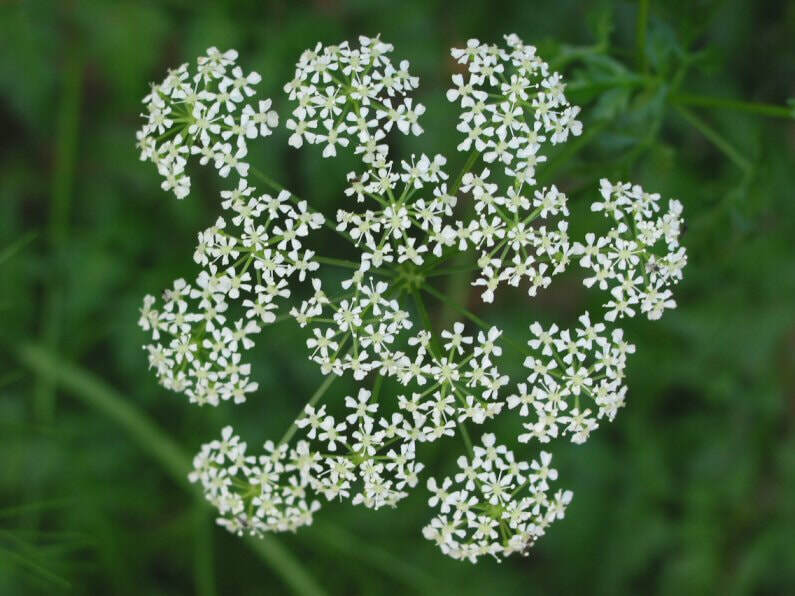 Hemlock was used for many breathing problems including bronchitis, whooping cough, and asthma; and for pain in conditions such as teething in children, swollen and painful joints and cramps. It was used medicinally for many years in treating tumors, ulcers and gout. Hemlock is also used for anxiety and mania. Other uses include treatment of spasms, skin infections, epilepsy, Parkinson’s disease, Sydenham’s chorea, and bladder infections. Very few deaths have ever been reported due to hemlock ingestion, but the plant is potentially lethal. Avoid the roots. 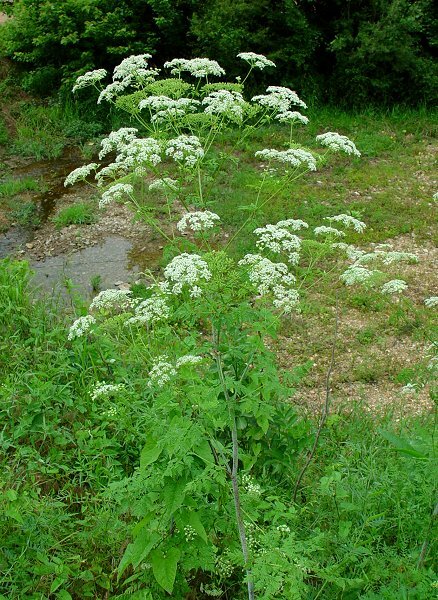 Hemlock has also been used to treat strychnine poisoning. Conium maculatum commonly occurs in sizable stands of dense growth along roadsides, creeks, field margins, ditch-banks and in low-lying areas. It also invades native plant communities in riparian woodlands and open flood plains of rivers and streams in California and similar regions in the US. It is common on shady or moist ground below 5000 feet, especially in California. Poison hemlock reproduces only from seed, both as a biennial and winter-blooming annual. Seeds germinate in fall and plants develop rapidly throughout the winter and spring. Some produce flowering stems in the first spring and die in the summer. Others remain in the vegetative stage without producing flowering stems until the second spring, thus becoming a biennial. Plants are more likely to be biennial in very moist situations, or when sprouting in Spring. After producing seeds, the plants die in the summer. 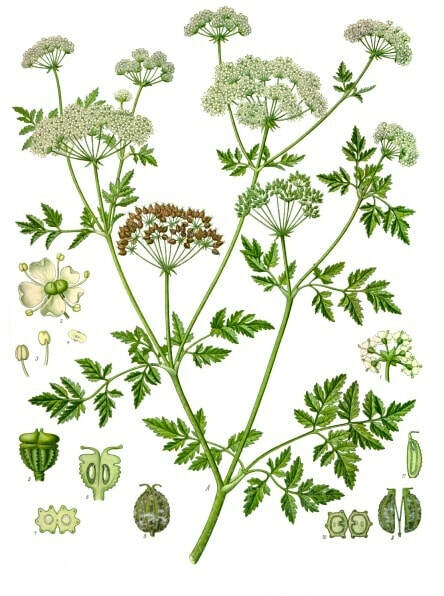 Hemlock is propagated by seeds which can adhere to farm machinery, vehicles, agricultural produce, mud and clothing as well as being carried by water, and to a limited extent, wind. Hemlock is capable of rapid establishment after heavy autumn rains, particularly on disturbed sites or where little vegetation exists at the start of the autumn growing season. Once it is firmly established under such conditions, hemlock can choke out most other vegetation, barring drought. Several states have declared it an invasive species. Wormwood, coffee/caffeine, and administer CPR. Hemlock kills by stopping the heart and lung muscles through relaxation. CPR applied for the duration of poisoning (eight to 24 hours) will save a victim and enable a full recovery without damage to the body, brain or organs. DANGER: Strong Muscle Relaxant! : Conium maculatum can be deadly to both humans and livestock. Hemlock is NOT a poison, it just picked up that name to scare away the uninformed and ignorant. It contains a strong muscle relaxant, sort of like valerian on steroids, but it can only kill in very large doses by relaxing the heart and lung muscles too much. It was used in concentrated tincture form to put Socrates to death thousands of years ago and has been used for ages as a natural means for a compassionate death with dignity in terminal patients with acute pain, along with morphine. 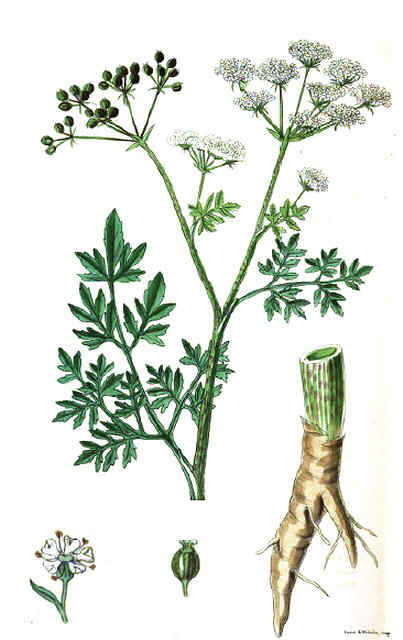 Accidental poisonings have occurred, although very rarely, when people mistook the root for wild parsnip, its leaves for parsley, or its seeds for anise, the latter having a distinctly anise smell (field taste before picking; unlike belladonna, hemlock is disagreeable in all aspects: both taste and odor). Poisoning of humans, although rare, has occurred after the ingestion of seeds, leaves and/or roots. The seeds and root are the most concentrated parts of the plant. Extracts of hemlock were used as arrow poisons by many North American Indians, even though hemlock is non-toxic. The average adult can ingest literally many hundreds of hemlock seeds with no noticeable effect. ​Hemlock has fern-like leaves that resemble anise, as do the seeds. The leaf configuration is notably different than anise, however. The thick carrot-like roots hold moisture. The lower stems have purple spots, and all parts of the plant have a disagreeable odor. The stems are hollow, unlike other thick-stemmed flower stalks such as anise. Seeds are light tan to dark white, but darken with age, sun and rain. Full sun to mostly shady. Plant in fall. Tolerates frost. Water is crucial. Wet feet preferred. Think bogs and stream side. Hemlock seeds are easy to sprout and grow. Hemlock prefers wet feet, meaning, it likes to be situated near abundant ground water. It typically grows along the banks of rivers and streams where the roots have a way to be constantly in moisture. The root is thick like a carrot which helps the plant hold more moisture. This plant is devastated by drought. It loves water. If you grow hemlock, it should be labeled so ignorant people do not pick any part of the plant. It was brought to the New World mostly as a garden plant that blooms in winter and adds green fern-like color to an otherwise dreary winter landscape. I personally have grown it for years without any issues, and in the winter, it is the prettiest plant around.